thanks for being a wonderful friend and gaming buddy! I hope he likes it :). It was fun to make :). Is "HBD" suddenly the cool kids' favourite TLA or something?? Maybe it's a Singapore thing? Your Dad's there, right? nope, it's actually been around for ages and not at all culture specific :). I'm sorry, Joyce!! Happy belated birthday!! 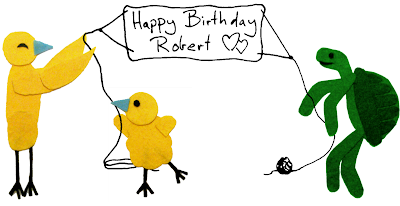 Rob holds a special place on my blog and in my heart- he invented the turtle. Well, God did that. But Rob requested a turtle. And with an empty wallet, I decided I ought to take the time and effort to create something for his anniversary-of-birth.